New York City is famously the ‘city that never sleeps, ’ and if you don’t have time to sleep, you certainly don’t have time to sit and eat! One of the best things about New York is the amazing street food – food you can eat on the go, but also an opportunity to try new and exciting things that you maybe wouldn’t see on your average restaurant menu. 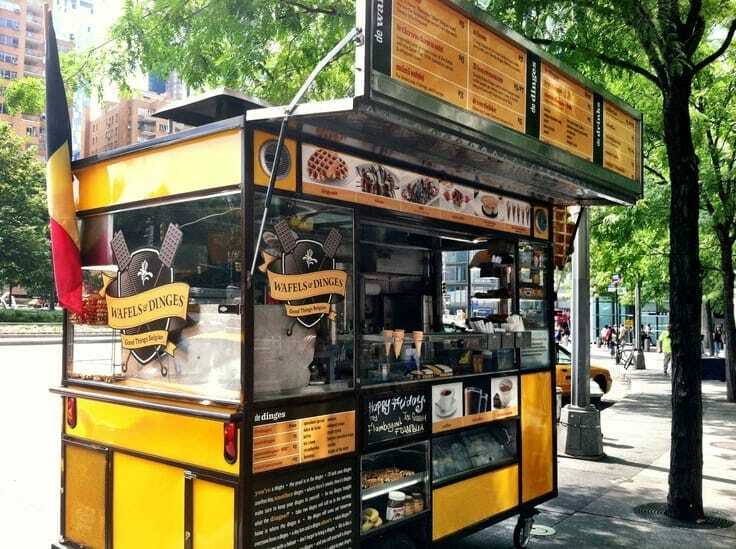 Since 2007, the bright yellow trucks and kiosks of Wafels and Dings can be found all over New York. After King Albert II of Belgium took umbrage to the poor quality waffles that were being sold as ‘Belgian.’ He knighted Thomas DeGeest ‘Special Envoy for Wafels’ and so Wafels and Dings was born. The company has won numerous awards. They sell both savory and sweet waffles, and according to their website, your first dings is free! The Melt Bakery creates mouth-watering ice cream cookie sandwiches, that range from the simple to wildly adventurous and seasonal flavors. The two guys behind the company began working together in summer 2010 with only $350 to pay for their ingredients and renting a kitchen. They have several locations across New York, and you can even get an ice cream sandwich delivery to help with that 3 pm slump at work! Uncle Gussy’s is a favorite lunchtime choice in Midtown. Food vending has been in the family for years and for the last eight years brothers Franky and Nicko have been working on Park Avenue, offering traditional Greek cuisine with specials that change weekly. Keeping it in the family, their mother Katerina also works in the kitchen. Their specialty is Tzatziki sauce, a traditional element of Greek food and it is made from scratch by their mother. Husband and wife team Ariel and Leni are bringing two staples of Argentinian food to the streets of New York – empanada and medialunas. Their handheld snack makes on the go eating super easy, which was Ariel’s goal with his products. 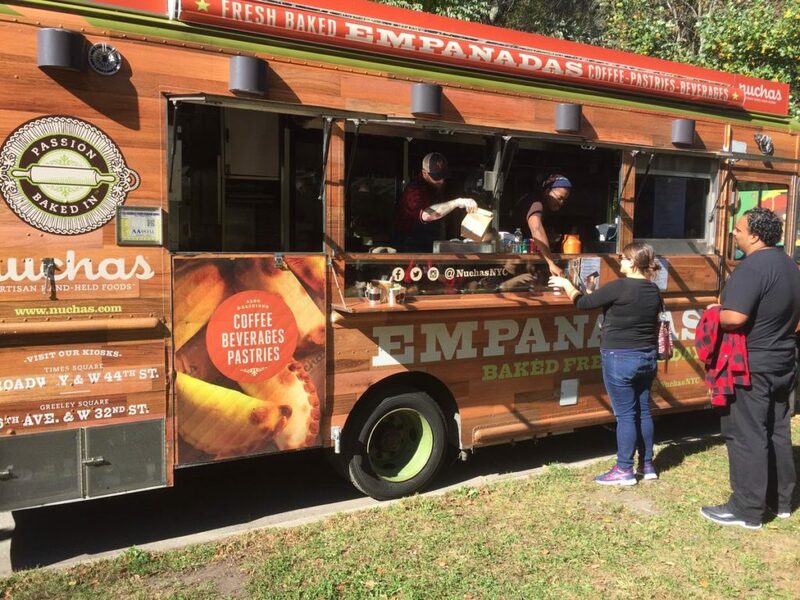 They opened their first retail location in Times Square in 2011 and got their first food truck in 2012. In the following years, they have won Rookie of the Year and People’s Taste Vendy Awards. Their menu takes into account all possible cultures and dietary restrictions to let everyone sample the taste of Argentina. The Halal Guys began originally in 1999, with a hot dog cart in New York City. They soon realized there was a big demand for halal meat which is where their famous chicken and gyro over rice came to be. Their food is a mixture of Middle Eastern and Mediterranean flavors and follows the strict Islamic guidelines that are involved in Halal meats. Today it is the third most reviewed place to eat on Yelp in the whole of the United States! This is just a small sample of all the wide variety of food trucks that are available in New York City. When you go to a city as eclectic as New York, you have to try as much food as possible – so pack your loose pants and get snacking!